Dogs — They’re Just Like Us! While I’m off at Universal Studios today, Jamie from SnapGinger is here to share with you one of my favorite type of posts to read… dog posts! Jamie thought it would be fun to do a spin-off of Us Weekly Magazine’s “Stars — They’re Just Like Us” column, and what better way to do that than with her cute dog, Roxy! Without further ado, here’s Jamie and Roxy. Hi hellorigby readers! I’m Jamie from SnapGinger, a Lifestyle Blog. Where did that curious name come from? Well, SnapGinger is just one of my many nicknames, in reverse (GingerSnap was taken), so I ran with it! I’m a born and raised Jersey girl, and my little lifestyle blog is my place to inspire others to live life to the fullest, and enjoy every sweet and snappy moment of it. (Get it?!) Whether I’m sharing recipes, pics of my dog Roxy, beauty reviews, classic fashion or housewifey tips, SG is your source for ideas and thoughtful touches for beautiful living…Snap to it. Jenn was gracious enough to let me guest post for her while she was away, so, without further ado, here is my post! They can nap for days! They dress up for Halloween! They do lunch with their girlfriends! They binge watch Breaking Bad on Netflix, in character! They love a good cheat day! They often ponder the meaning of life. Thanks for stopping by, head over to SnapGinger to keep the fun going! Thanks so much to Jamie for such a fun post… Rigby has got quite the crush on Roxy! 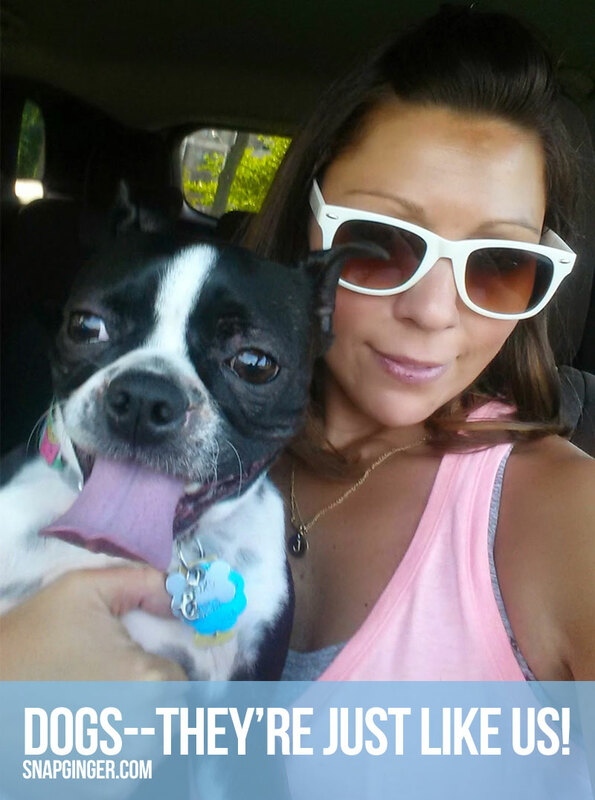 You can check Jamie and her cute doggie, Roxy, out on Facebook, Instagram, Twitter, Pinterest, Tumblr, and G+! Haha, love it! Thanks for such a great post girl! I love this! My Maltese is such a little person! Aren’t dogs funny like that?! Glad you enjoyed, Catherine! Couldn’t agree more! I even wrote a post about a day in the life of my fur bag, Chewie. It was really fun and interesting to turn the camera around on her and pay attention to what she’s actually doing all day. Contrary to poplar belief, not all dogs nap all day long. Love your pup! So cute. What a fun idea for a post. Glad you enjoyed, V! I’m definitely going to go check out Chewie’s post too! Isn’t Roxy cute? Thanks for reading, Olya! So cute! What a fun post idea! Too funny! Perfect read for a Monday !!!! Oh these pics are adorable! My pets are my babies! I know right?! Obviously Rigby is like my child, so I feel ya Chelsee! Aw, so happy to hear that, Susana! Aw what a cute little dog! I love the cheat day picture. He looks like he’s stretching his eyeballs as far as they can go! Hahaha this is such an awesome post! I love the binge watching Breaking Bad in costume! Too cute! I know right?! That one was my favorite! Seattle fashion and beauty blogger on a mission to share budget-friendly style. Life is expensive, your wardrobe doesn’t have to be! © 2013-2019 Hello Rigby by Jenn Haskins. All rights reserved. Affiliate or referral links are sometimes used on posts that appear on Hello Rigby. Thank you for supporting the brands that help pay the bills! Questions? Read my full disclosure.